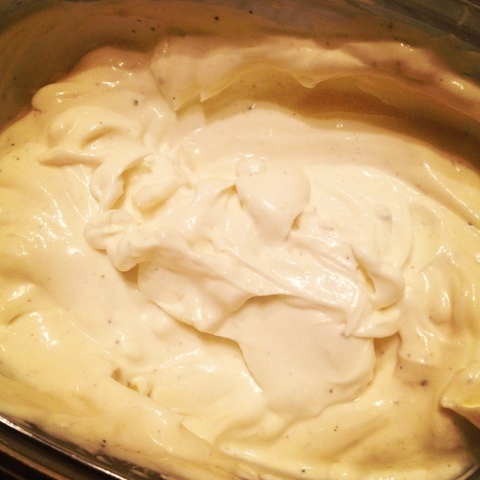 A couple of weeks ago I decided to try to make homemade mayonnaise. You might wonder: why make it at home? Supermarkets have so many variations that there is no need to make it yourself. What I often find is that store-bought mayos contain useless carbs, for example my favourite store-bought mayo still has about 5 grams of carbs per 100 grams of product. But if you make it at home, it has almost 0 grams (0,67 grams) of carbs per 100 grams. Making it is so easy. Just crack your egg in a long tall container that fits your stick mixer. Add a bit of salt, pepper and mustard. Add about 10 grams of lemon juice and couple of drops of vinegar. It really depends on how sour you want your mayo but you can’t leave something acidic out, then you won’t get mayo. Pour in your oil. Then put the mixer right to the bottom and mix it for 10 seconds but do not move the mixer. Then slowly start to move up with you mixer until you reach the top. If the mayo seems to thick, add a little bit of water and mix it in until you get to the consistency you like. Taste it, add seasoning if need to. Then you can play around with it: you can add garlic or paprica powder etc. Store in an air-tight container in the fridge. Mine hasn’t ever gone bad in 1,5 weeks (don’t know about any longer because I’ve always used it up in about a week). The whole recipe (300 grams of mayo) is 2179 kcal, 7 g of protein, 2 g of carbs and 242 g of fat. Makes 30 10 gram servings. Per serving: 73 kcal, 0,2 g of protein, 0,06 g of carbs, 8,1 g of fat. Eelmine Dilemma: how often should you weigh yourself? Extra virgin oil can have too strong taste for mayo. It’s nit against LCHF, use it freely in salads etc. You can try it but most people like mild tastin oils in mayo better.